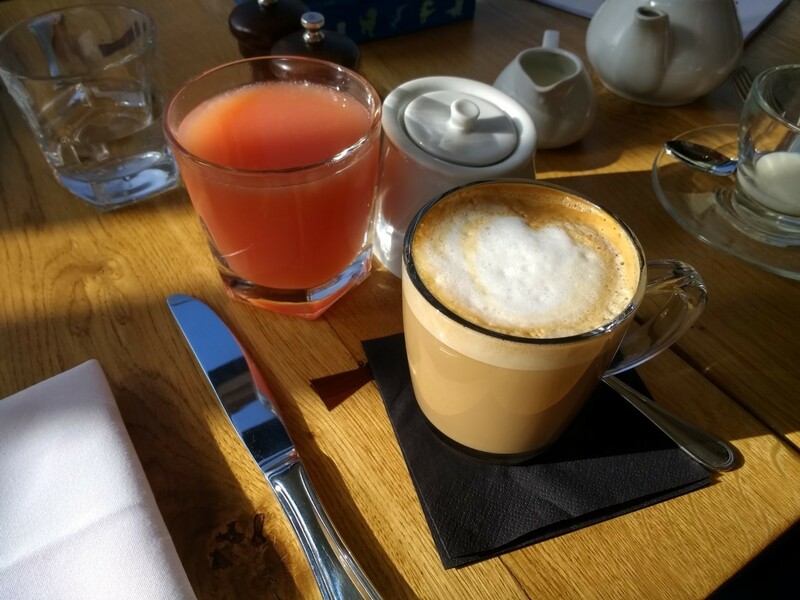 For Mother's Day, my family and I chose to try the weekend brunch menu at a relatively new restaurant in East Sheen called Canham. Since it opened in November, this was my third visit - my husband and I went there for dinner in its opening week, and then in February I went for drinks in their basement bar. According to the restaurant's website, Canham is the collaboration of two Chefs, Matt Williams and Kristian Kurn. Using British ingredients, the food is crafted with precision, with an emphasis on flavour and simplicity. I certainly found this to be true when we went there for dinner - perhaps a little too much emphasis on simplicity for my liking, but definitely flavoursome. So, I was interested to see what the brunch offering would be like, especially now that they'd had a few months to settle in and perfect their style. Being the early birds that we are, we arrived just as it opened on Mother's Day at 9.30am, and so - aside from a lone coffee drinker at the bar - we were the only people in there for the duration of our breakfast, which suited us fine. Our two young girls got to enjoy playing with the restaurant's multitude of toys without getting under people's feet, while my husband and I enjoyed a leisurely brunch. The brunch menu has a huge range of options to choose from. I opted for a delicious full English breakfast (minus the black pudding and kidney) for £11 and a pot of tea, while my husband and girls had scrambled eggs, avocado and toast. Other choices include porridge with fresh fruit (£4.50), eggs benedict (£9.50) or smoked salmon, potato rosti & dill crème fraiche (£10). I certainly wasn't disappointed with my offering. The restaurant also has an evening a la carte menu which offers a good selection of starters, mains and desserts, as well as appetisers and sides. Starters range from £6 - £8.50 and mains from £12 - £20. You can view all their menus and extensive wine list here. Canham has a spacious basement bar and regularly has live music on. Since we moved to the area four years ago, Canham is already the third restaurant to take the lease at 40 Sheen Lane, but something tells me this one is here to stay as it has already established itself as the place to be seen in East Sheen. If you fancy giving Canham a try, it's just a short walk away from Mortlake station, as well as the many bus routes on nearby Upper Richmond Road.